This easy-to-make blend blend can help minimize acne. 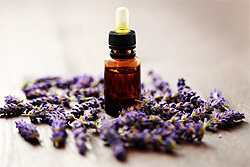 Although Tea Tree Essential Oil can smell a bit medicinal, the Lavender Oil helps to balance the aroma. Everyone is different, so essential oil recipes aren't always effective for everyone. Use this blends as a source of inspiration for finding the essential oils and blends that work best for you. When selecting and using essential oils, be sure to follow all safety precautions and remember that aromatherapy should not be used as a substitute for proper medical treatment. Pour the selected carrier oil into a very clean bottle (amber glass is best) and then add the essential oils and tightly close the bottle. Although bottles with rubber dropper tops should not be used to store undiluted essential oils, it is okay to store this recipe in a bottle with dropper top. Roll the bottle to gently mix the oils for a minute or two. Apply a tiny amount to the face, neck or back, but be certain to avoid the eyes, lips, nostrils and inside the ears. Gently roll the bottle before each use to ensure the essential oils are properly mixed. Use up to twice daily. Immediately discontinue use if you notice any discomfort or irritation. AromaWeb's Facial Toner Recipe can also be helpful in supporting healthy skin.